Here is the link to Amazon to order your copy! I recently went on a week-long fishing trip. I enjoyed the chance to relax and connect with my buddies. 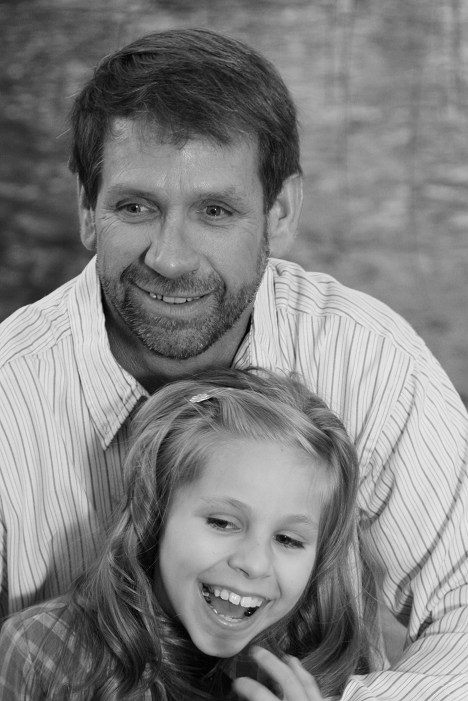 But when I returned home, the degenerative aspects of my daughter’s disease seemed to have progressed dramatically. My wife told me she’d been falling asleep on the school bus. Now, I know a lot of kids fall asleep on the bus. But Shayla has always been overwhelmingly excited about school, including the ride there and back. As I tucked Shayla into bed that evening, she was extremely lethargic. I asked if she’d missed me while I was away. She said she didn’t even know I was gone. Whenever I’ve been away for even a day, the first she’s always told me is how much she missed me. She continued to look confused. It suddenly hit me that she knows this is how she is, and she’s okay with it. I knelt beside her bed and did my best to hide my pain as I prayed desperately for Jesus to heal my daughter and give her the quality of life she deserves. After prayer time, I gave Shayla some tickles to try to lighten up the heavy mood. Then I tucked her in with kisses and hugs, telling her how special she is, just the way she is. Shayla asked, “Can I say a little prayer now?” When I told her to go ahead, she prayed, “Jesus, please help my dad to feel better.” Shayla has always been more concerned about me and my feelings than about herself. There’s absolutely nothing wrong with Shayla’s faith. It’s mine that needs constant adjustment. Instead of begging God for a miraculous physical healing for my daughter, I need to start praying that my faith in Him will become stronger and more childlike every day. I found this picture of Shayla when she could walk a little. 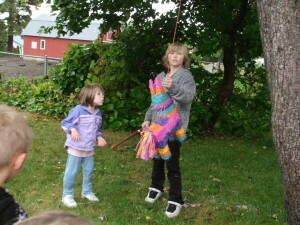 Playing Pinata with her older brother Chase at her Birthday party. I believe she’s six here and Chase is Twelve. This morning as I went to make sure Shayla was okay while she was using the bathroom as I walked in heard a thump. Rushing in Shayla told me she had almost fallen. The same fear my wife and I had just discussed on our way home from the car races. If Shayla falls the wrong way the porcelain tub is right there (not good). It’s clear it’s time to change something for her safety. Shayla has had some good days as of late. She has been it seems at least a little more active than usual. Playing more with her little sister (Taytum) instead of just lying in her bed playing on her i-pod (which at times is all she does). Not only giving her what seems to be more energy but also seems a lot happier. Which in turn obviously makes for better days for all of us to see her laughing and happy.. When Shayla is like this she is such a joy, her laugh is contagious and it’s amazing the beauty that auras off of her when she’s like this.. Love you Shayla! God Bless All! Nadine and I usually avoid conversations about my [how old is she now? 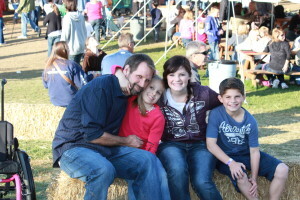 ]-year-old daughter’s medical condition because of the pain that topic stirs inside our hearts. But with rain pelting our windshield, thunder bellowing, and lightning bolts flashing on the horizon, I felt as though all the angels in heaven were grieving with us. I agreed … and thanked God for my smart and level-headed wife. For the rest of the drive, with the windshield wipers barely keeping up, we discussed what we could do to make sure Shayla was safe yet give her as much mobility and independence as possible. We tossed around a few ideas but came up with nothing. At dinner that night, I noticed Shayla having trouble bringing her sippy cup to her mouth. In spite of the conversation I’d just had with Nadine, I couldn’t stop myself from doing it for her. During the evening, as my wife and I encouraged Shayla and our other children to share about their day at school, I noticed my daughter seemed rather depressed, which was unusual for her. She’s always had a positive attitude, even in the midst of battling this horrible disease that has attacked her body since she was [how old?]. I am thrilled that Armonia Publishing has offered me a contract to publish Divine Healing, God’s Way. If this book can bring a lost soul into God’s eternal kingdom, or bring a wandering sinner back into the loving arms of our heavenly Father, it will be easier to understand and accept the heartache my family and I live with every day of our lives. The Lord has placed on my heart that it’s time to do what he has called me to do and to be the man/husband/dad he has called me to be. With that being said as I looked at pictures this morning from years ago of my new and young family I could not help but choke up realizing how fast life is passing by and how little I have stopped to appreciate the gifts that God has given me in them. Looking at these pictures it seems like they were taken yesterday until you see how young the kids are in them. Life is so short and with the businesses and everything going on if we don’t prioritize what’s the most important our memories will be snap shots. So for me it’s time to get the book done, to prioritize my time with my family, to be the dad the kids need, to be the husband my wife deserves and to be the man God has called me to be. Welcome to the Official site of Daniel Arrotta. Author of Divine Healing, God’s Way.